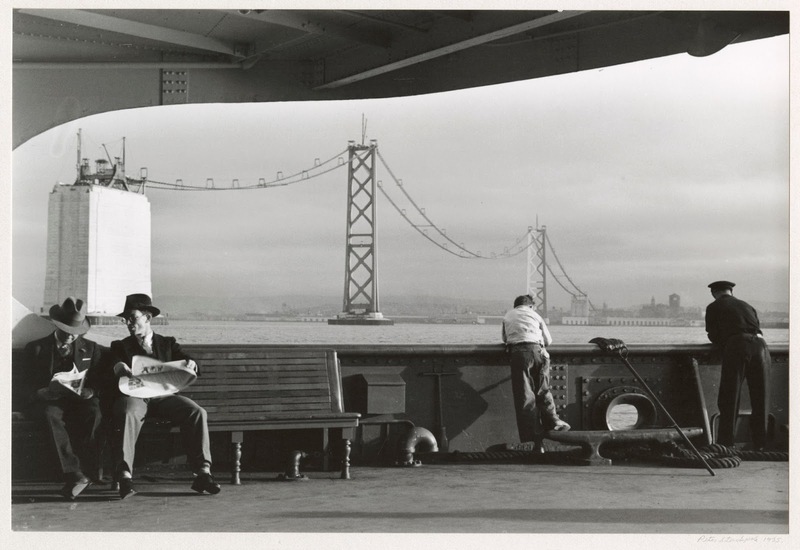 When the photo exhibit “Bridging the Bay” opened in July at the Oakland Museum of California, it marked the first time the museum’s full set of Peter Stackpole’s bridge building images from the 1930s have been publicly displayed since being acquired. It has taken two decades to gather the two dozen images that form the collection’s core. “We’ve brought them out one or two at a time, but this is the first time they will all be gathered together in one space,” said Drew Johnson, OMCA curator of photography and visual culture. The show runs through January 2014, and, if the new span of the Oakland-Bay Bridge opens any time soon, it will be a cleaver positioning of these fascinating historical photos. Bridging the Bay focuses on Stackpole’s the early work–he was 21 when he began taking photos of the bridges under construction–and includes quotes from the late artist that interpret the moments and people he captured on film. The selection includes interesting vantage points from the tops of catwalks, beautiful shots that render the bridge’s components in abstraction, and portraits of the construction workers, who faced great personal risk on a daily basis. 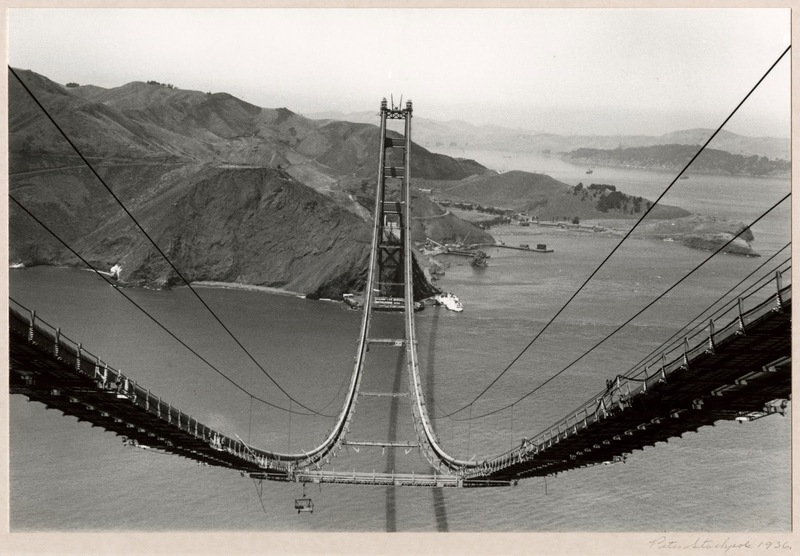 As a young photographer in his 20s, Stackpole’s technical expertise and experimentation with the hand-held camera allowed him access to a subject—the construction of the bay’s two bridges—that no other photographer had captured at the time. On Aug. 30, “Above and Below: Stories From Our Changing Bay” will open in the museum’s Great Hall. It runs through February 2014, in hopes that by then there will be an opening to celebrate. 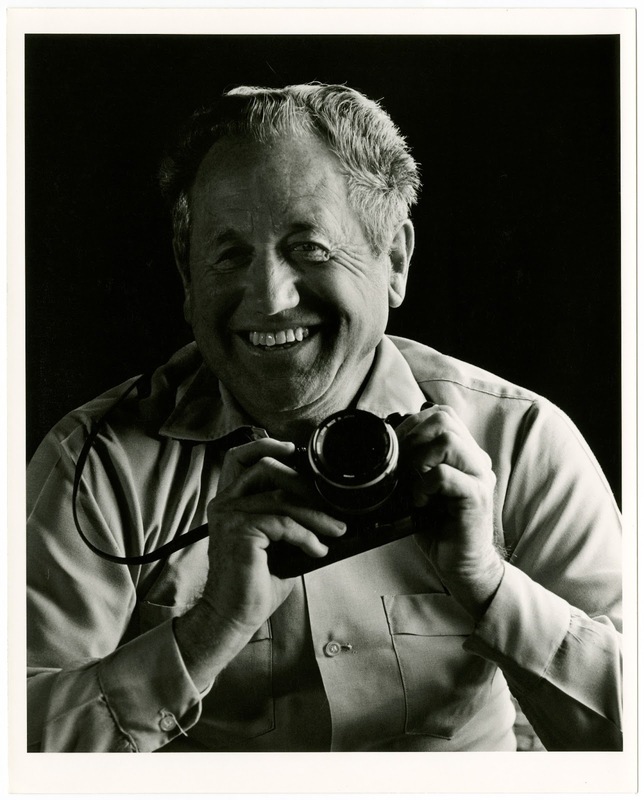 Funded by the state’s Caltrans, the multidisciplinary exhibition will include aerial photography of the bay, though it will be hard to top the aerial photography taken by Stackpole, who was holding on with one hand while shooting with the other. “That thing can’t make art,” Stackpole’s father, a well-know San Francisco sculptor and painter Ralph Stackpole reportedly said after seeing the miniature Leica. But that didn’t stop his son from climbing the bridge towers like the rest of the building crew. As long as Stackpole wore a hard hat nobody objected to him being up there. Nobody paid him to be up there either, until “Vanity Fair,” ran a spread, in 1935. Someone from the San Francisco Museum of Art saw it, and Stackpole’s bridge photos were given a show before the bridge had even opened. 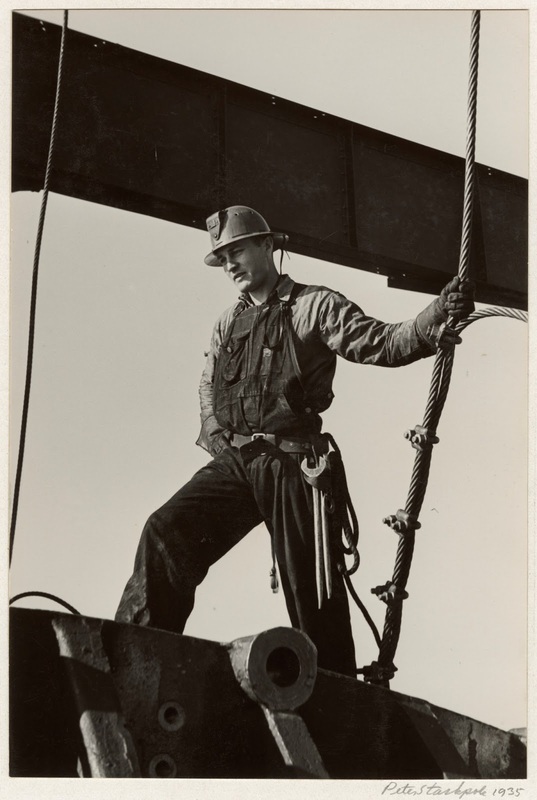 You won’t need a hard hat to enjoy these images at the Oakland Museum of California that offer both an historical and artistic perspective on iconic infrastructure that helps define the San Francisco Bay Area.